At the risk of sounding like a culinary Scrooge, there is probably no such thing as a sugar plum. The term is not listed in Larousse Gastronomique, so it’s probably not gastronomically sound. Indeed, there are listings for sugar beet, sugar cane, caster sugar and barley sugar in the Oxford Companion to Food, but alas, no listing for sugar plums. There is a Wikipedia Sugar Plum entry, but it is a suspiciously vague stub, having more to do with the Night before Christmas, and the Nutcracker Ballet. Perhaps sugar plums are more a state of mind than of sugar consumption, because if the last few days are any indication, I do believe that sugar plums indeed exist. 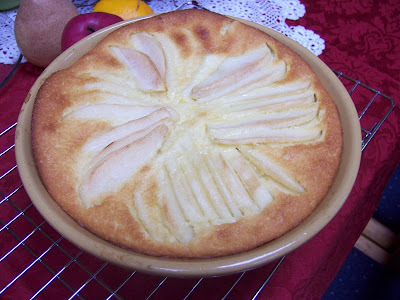 The delicate top of the miraculous Pear Custard Pie prepared for my brother Ken and sister-in-law Pam’s annual Caroling Party has the effect of a white poinsettia or “angel wings” in the snow. 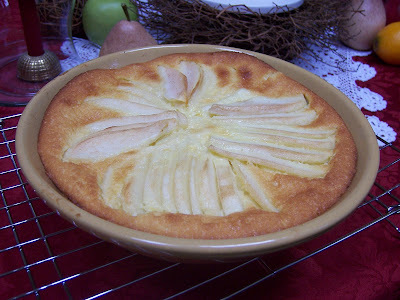 It is so simple and elegant, and offers the sweet nectar of Bartlett pears and a feathery golden custard filling. 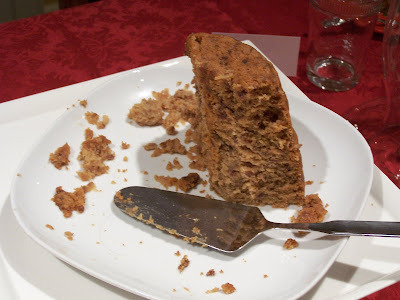 The second annual Christmas Pudding, is a mountainous, amber-colored Steamed Date Pudding with Whiskey Sauce that is the grand finale of my Christmas Day Dinner. A weekly showering of Irish whiskey makes it a truly spirited and festive dessert, so potent that my nephew Doug, a fraternity-dweller, even thinks it packs a punch. A half-cup of whiskey is warmed and then poured over the pudding. Then a flick of the Bic, and blue flames dance merrily about the pudding. After a day of revelry, and serving dinner to nine people, it sure ignites my holiday cheer! If you’ve never seen an actual Christmas Pudding blazing, click on the clip below – almost live – from my dinner table on Christmas Day. But, don’t look away, because the flame is fleeting, much like the holiday season. 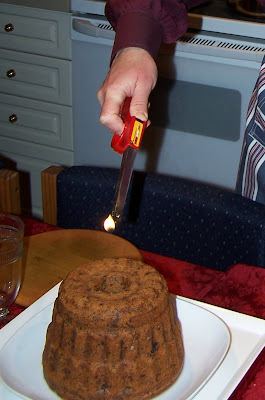 I love a pudding you can light on fire! How incredibly festive! And thanks for the information about sugar plums; I always wondered about that. Happy holidays and happy new year to you. Okay Mr. Culinary Scrooge, I've never heard about Sugar Plums anyway. I love the lighting of the pudding. Happy new year! That is crazy! I love the flash from the cameras as it adds a movie like quality to the lighting. More importantly how did it taste? The lighting of the pudding-- a live view on our computers. I like that! Hey, TW- I thought I'd share this link from Kevin's cookie entry. He submitted--you guessed it--sugar plums! May your 2008 be spectacular! The pear custard pie looks delicious and your Christmas pudding seems ready for a red carpet debut....photo flashes and all!!! Wishing you a very happy new year. Lydia - I agree - "flaming anything" is a good thing! Happy 2008! Veron - You'll have to research sugar plums! Happy New Year! Bradley - I thought the pudding tasted great! It was chock full of dates and pecans, and of course, the whiskey! Maryann - Mood music is always important! Susan - I will check out Kevin's link - All the best for 2008! Happy New Year, Diane! I'll let you know if the Christmas Pudding "goes Hollywood" on me! Oh brother.this was great to watch, better late than never! The cake was gorgeous, I could see the flower design you were going for, with the sugar plum.....he he! Happy New Year to you! Thanks so much, Jann - Happy New Year to you, and best of luck with the new store!